Vantage is the platform for Pervasive Data Intelligence. The only software of its kind, capable of managing all of the data, all of the time. So, you can analyze anything, deploy anywhere, and deliver analytics that matter. Vantage offers full integration with your favorite tools and languages, leading analytic engines, and new sources of data to deliver the answers you need to create better business outcomes. 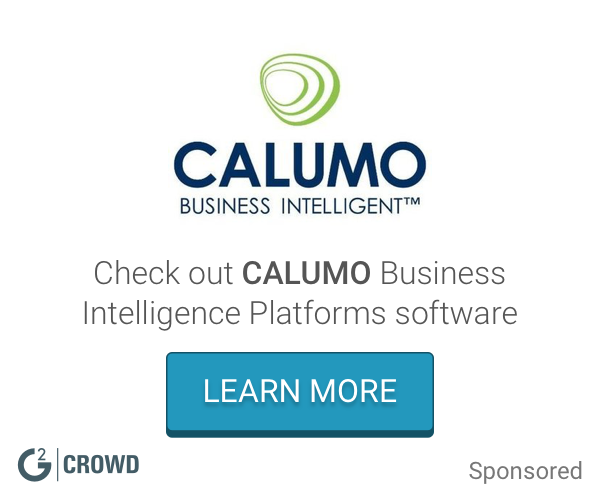 What Business Intelligence Platforms solution do you use? Domo Business Intelligence (BI) combines a powerful backend that sits on top of and connects into any existing system where data lives, including those for customer relationship management, enterprise resource planning, human resources and financials, as well as any data repository or current reporting system. InsightSquared helps sales operations professionals break the cycle of spreadsheets by equipping them with actionable, real-time intelligence on virtually all sales KPIs. Fast growing technology companies rely on the company's solutions to forecast more accurately, better manage pipeline, tailor rep coaching based on individual performance, and conduct data-backed planning and analysis. Looker supports a discovery-driven culture throughout the organization; its web-based data discovery platform provides the power and finesse required by data analysts while empowering business users throughout the organization to find their own answers. Tableau Server is a business intelligence application that provides browser-based analytics anyone can learn and use. MicroStrategy provides a high performance, scalable Business Intelligence platform delivering insight with interactive dashboards and superior analytics. SAP BusinessObjects Business Intelligence (BI) offers data-rich business intelligence. Drive more intelligent processes and decisions _ with business intelligence software. The QlikView Business Discovery platform delivers self-service business intelligence to empower business users and drive innovative decision making. Oracle Essbase is the industry-leading multi-dimensional online analytical processing (OLAP) server, providing a rich environment for effectively developing custom analytic and enterprise performance management applications. Comprehensive suite of enterprise BI products, delivering the full range of BI capabilities including interactive dashboards. * We monitor all Teradata Vantage reviews to prevent fraudulent reviews and keep review quality high. We do not post reviews by company employees or direct competitors. Validated reviews require the user to submit a screenshot of the product containing their user ID, in order to verify a user is an actual user of the product. Hi there! Are you looking to implement a solution like Teradata Vantage?